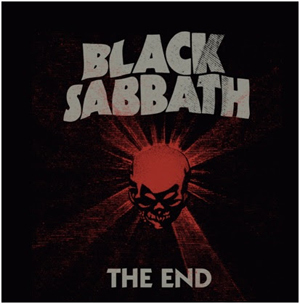 With BLACK SABBATH's 2016 THE END Tour launch now just a week away, comes exciting news about a new special limited edition CD--The End--to be sold exclusively at shows on the legendary band's massive worldwide final tour. Featuring original artwork by Shepard Fairey/Obey Giant, the CD is comprised of eight previously unreleased tracks: four songs are outtakes from BLACK SABBATH's worldwide #1, Grammy Award-winning album 13 and four live songs from the band's 13 World Tour. The CD features Ozzy Osbourne (Vocals), Tony Iommi (Guitar) and Geezer Butler (Bass), along with Brad Wilk (Drums) on tracks 1-4, Tommy Clufetos (Drums) on tracks 5-8, and Adam Wakeman (Keyboard) on tracks 5-8. Tracks 1-4 were recorded at Shangri La Studios in Malibu, CA and produced by Rick Rubin, mixed by Andrew Scheps at Punkerpad West and recorded by Greg Fidelman. Tracks 5-8 were recorded and engineered by Greg Price and mastered by Robert Vosgien at Capitol Studios Mastering. 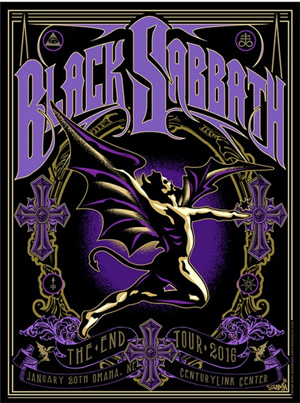 Beyond the collaboration with Shepard Fairey, BLACK SABBATH will celebrate artists each night of the tour by commissioning exclusive posters for each market on THE END tour. A example of the artwork is below. For those who can't wait for THE END tour to hit their city, the band has released a behind the scenes preview from their Los Angeles rehearsals. Set to debut Friday, January 15 at Blacksabbath.com and via the band's social media, the clip was teased via a short clip Wednesday, January 13. BLACK SABBATH will end the epic journey they began nearly five decades ago when their 2016 THE END world tour kicks off Wednesday, January 20 in Omaha, NE. The band--Ozzy Osbourne, Tony Iommi and Geezer Butler--will then head to Australia, New Zealand and Europe (for a mix of summer headlining and festival performances), before returning to North America in August. The massive 2016 world tour by the greatest Metal Band of all time marks THE END for BLACK SABBATH as they close the final chapter in the final volume of the incredible BLACK SABBATH story with this tour. BLACK SABBATH's THE END farewell tour promises to surpass all previous tours and will feature the band's most mesmerizing production ever. The support act for the whole tour is RIVAL SONS.